Finally, it is important to bear in mind that for public price stabilization policies to be effective, they need to be realistic, transparent, and credible. What needs to be done is to define a sufficiently wide, flexible price range to determine the thresholds for State intervention. These “intervention prices” will have to be announced publicly, be credible, and be respected, otherwise public intervention could well increase uncertainty among market operators rather than reducing it ( CIRAD ) .Volatility is a directionless measure of the extent of the variability of a price or quantity. It follows that volatility measures derive from the second moment of the distribution of the price or quantity in question, or transformations thereof. Economists generally focus on the standard deviation of logarithmic prices since this is a unit-free measure. For low levels of volatility, the log standard deviation is approximately equal to the coefficient of variation. The number of middlemen are present in vegetables and fruit markets. The rise of middlemen specializing in such activities as storage, transportation, processing , and retailing .These cost more .This is one of the reasons of fluctuating vegetables and fruit prices . Farmers are unaware of price news. Some middlemen and also some businessmen take this unethical advantage . they buy vegetables and fruits at lower prices from farmers and sell them in Dhaka city at higher prices . This is a common practice in our total food market . Intermediaries’ intervention: Middlemen buy products from farmers at lower prices and sell them in Dhaka at higher prices . This is common practice in our country. In-season stock tendency of businessmen: Some businessmen stock products during the season and sell them in off-season at higher prices. Farmers’ unawareness of price news: Farmers are unaware of market price of their products due to lack of proper information system. 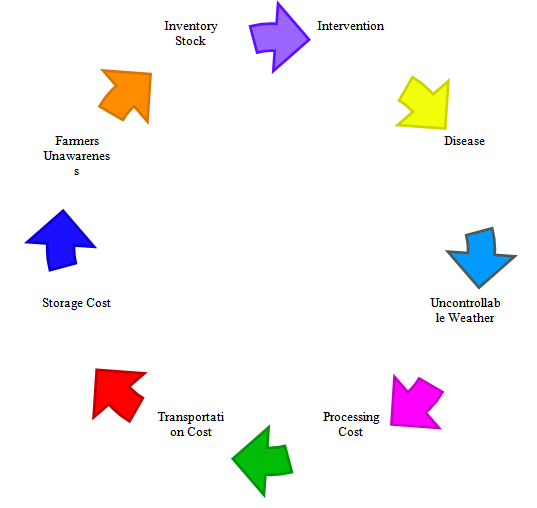 Distribution/transportation cost : Transportation cost is higher which is sometimes added to the price of the product . Weather condition: Unfavorable weather condition may hamper production and thus price. 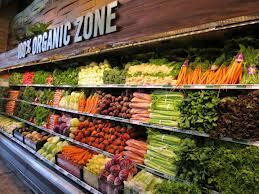 Disease: Because of various diseases price of vegetables & fruits may fluctuate. 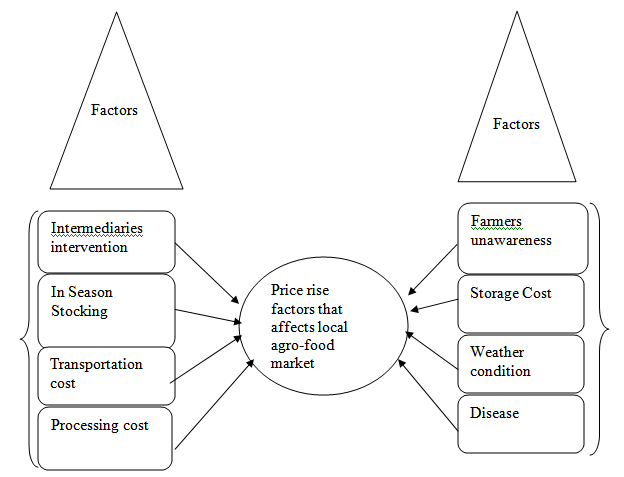 Figure: Factors causing fluctuations in agro-food market. Ali, M. and V.T.B. Hau.2001. Vegetables in Bangladesh. Technical Bulletin No.25. Shanhua, Taiwan : Asian Vegetable Research and Development Center .